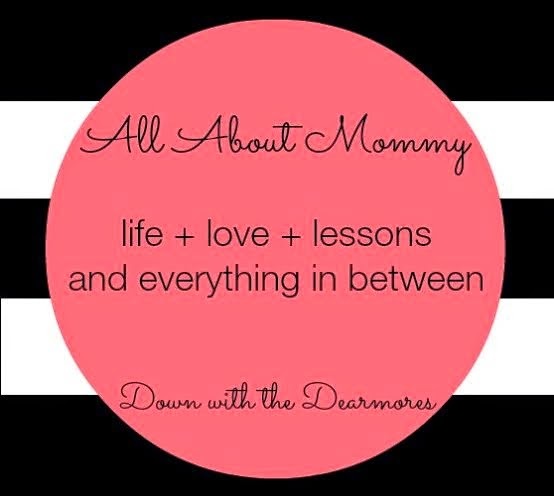 I'm so honored today to be guest posting for Jen at Down with the Dearmores as part of her "All About Mommy" series. I've really enjoyed reading all the guest posts from the fabulous mamas she featured and am just thrilled to be a part of it. It took me a while to figure out what I wanted to write about, but I eventually decided to give you a little less on "10 Things I've Learned as a Mom." Some of them are sappy/sentimental (I'm a pregnant hormonal wreck these days) and some are just for fun. I'd love it if you'd stop by and check out the post! Leave a comment and let me know what your favorite is. Number 8. Don't ever underestimate your children. Your kid will be smarter, quicker, sneakier, faster, trickier and craftier than you ever thought it was possible for a child to be. Yes, you'll be proud, but you'll also be in TROUBLE if you think for a minute you're one step ahead of them. You put the toy where he can't reach it...he'll find a way to move the couch so that he can climb up and jump across three other pieces of furniture, then scale the curtains to get it, along with your chapstick (which he just ate) and your wallet (the contents of which are now strewn about the room). Do not turn your back on your kids...ever. They will win (and something will get destroyed), I guarantee it. i loved all of this! i really loved the part about being nice to your husband....i mean seriously sometimes people forget that...and lets be honest...nobody wants to help or do nice things for a mean spouse...lol...kindeness goes a long way. LOVED #4 and #5! Sometimes I get a lot of questioning from my parents about my choices because "they didn't do it that way with me" but my boys have seemed to understand my choices really well. Most recently there was a play set issue that didn't allow them to play for a week, and once it was resolved, a fall happened, but no one was hurt and my big guy said, "See that's why mom made us wait." And #5, it's such a two sided comment because it usually goes like this: "enjoy every moment it goes by so fast" and "take time for yourself" - well I can't because I have to enjoy every moment ;)! Great list!! YES, YES, YES times 10. I agree with each and every one of your 10 things. You couldn't be more right. What a great post and a great reminder!